Be inspired to follow God’s calling in your life with this collection of powerful and engaging songs in Spanish. Throughout his young life, Iván Díaz has learned through ministry and religious education, what it means to be fully reliant on God—trusting that his will is perfect. With Honor y Gloria a Él (Honor and glory be to God), he has created the ideal Spanish resource, a collection of songs that invite us to be filled with God's love, joy and strength, songs meant to inspire us in the midst of our struggles. 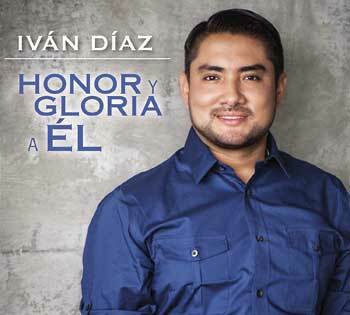 A pop album with hints of rock and Latin influences, Honor y Gloria a Él features a contemporary sound with songs that can be used in the liturgy as well as for praise and divine worship, that bouth youth and adults will be inspired with. With themes of adoration, hope, happiness, celebration, faith formation and more, these Spanish-language songs could easily be incorporated into prayer and youth groups, charismatic events, family ministry, missions and ministry retreats. Probably considered a favorite by the Hispanic population and those familiar with his music, “Brilla” is a song about hope with a beautiful melody and simple instrumentation. The title track fills a void for communities searching for a song for eucharistic adoration. Its simple melody and lyrics make it easy to learn and allow us to fully contemplate the Body of Christ. Working with a number of Grammy-nominated and -winning musicians, singers and producers, Iván has achieved a vibrant and moving collection that truly does honor and glorify God.